Here's a shot that was popularized by Lee Trevino back in the '70s: the sand wedge putt. Today, almost everyone on the pro circuit uses it - and yet I see very few amateurs giving it a try. That's too bad because it's a very useful shot, and you don't have to have the touch of Trevino to pull it off. When your ball is in light rough, just off the edge of the green, or is sitting on the outer edge of the fringe with its back up against the rough, you have a unique problem. More often than not, you want to get the ball rolling rather than try a chip. But if you use your putter, the flat blade will have trouble gliding through any grass that's taller than fringe. That's why pros use the sand wedge, where the sharp, heavy leading edge of the clubface cuts smoothly through the blades of grass. I'll grant you, the flange adds a bit of weight and therefore puts extra power into the hit, and it will take you a bit of practice to get a feel for distances on this shot. 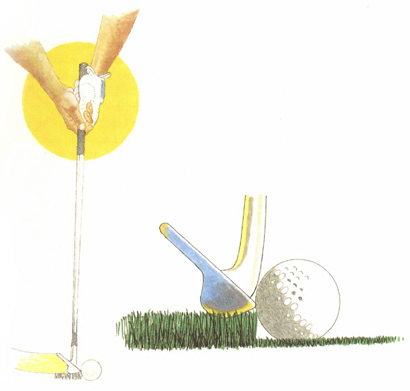 But the swingweight of both clubs should be about the same, and you should play it exactly as you would a putt, right down to your putting grip. Try to make that leading edge of the wedge strike the back of the ball. This may mean choking up on the grip a bit, and that's another reason the shot takes a bit of practice. But don't be afraid to try it. Once you're comfortable with it, you'll find it's much less risky than using a putter.